In the original design and in this this of Olaf one main problem is the high friction of the main shaft. I am thinking about how to solve this. I will try your proposal of a bigger main pulley. My understanding is that the 4 corner pulleys (or the pulley aside of the main pulley in the original construction) have only one task: guide the wire one winding up. The reason for this is for me, that the stepper inside has ball bearings and a load on one side will disturb the function of the stepper. Like a direct stepper - shaft connection which destroys the stepper (the reason for loose coupling). My information was from a CNC forum and the discussion was that screw holes are not exact. You are right, it's not applicable here. 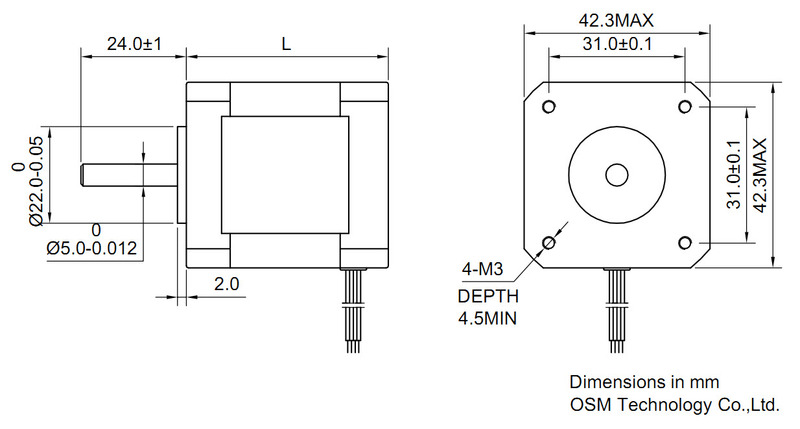 31.0 mm +/- 0.1 mm. The reason why I mention sideload so often, is the (much) higher tension required for cable vs. belt. That's why I came up with the 'fixed' cable drive. Because it can work with lower tension. But it's less useful for travel of more than ~20cm / 8 inches. I totally agree with the bigger center pulley. Although it reduces accuracy and torque. Max. diameter would be the equivalent of a 20 tooth GT2 pulley for me. An easy construction could be a steel pipe, put over the stepper shaft and fixed with a screw. A steel pipe, because you may find a precision pipe without seam/suture (ohne Naht). E. g. ebxx "Präzisionsstahlrohr Präzisionsrohr nahtlos E235 Blank Länge 1000mm" with a diameter of 10 mm and thickness 2.5 mm. Then you have an inner diameter of 5 mm. It may be easier to use a stepper with a shaft with indentation/notch/groove to fix it easily with a splint. Edited 2 time(s). Last edit at 08/29/2018 01:52AM by JoergS5. This +- 0.1 mm was what the author talked about as being inexact (but not only this tolerance, but the screw hole itself is wobbly). He used a hair ruler to line up the shaft with the stepper shaft, and the tolerances were about 1/100 mm. But not so important for 3d printing. I just wanted to post a picture of the printer at my workplace. Maybe it'll help with future designs? That motor mount doesn't look very sturdy. I used a similar printed drive pulley for a while - until the cable destroyed it. The cable is just allowed to walk up and down the drive pulley? Does it make plinky noises when it runs? How do you keep the cable parallel to the guide rails when it walks up and down? How long does it run before you have to retighten the cables? What kind of cable does it use? The cable is just allowed to walk up and down the drive pulley? I don't think it walks up and down. I'll confirm. Does it make plinky noises when it runs? How do you keep the cable parallel to the guide rails when it walks up and down? I haven't paid close attention, but I want to say the string doesn't walk up and down. I'll take a video the next time I run a print job. Per the manual, the drive system should be checked every 300 printing hours. The machine is approaching close to ~800hours without any maintenance to the drive system, and I haven't seen any slack on the string. Not sure what type, but from their brochure, if I recall correctly, it's some kevlar line (will need to confirm). Edited 1 time(s). Last edit at 09/14/2018 02:37PM by banana_muffin. its a fusion 3 printer. could try asking them... though i think they may have patented it if i remember correctly. so could always go look up the patent. Edit: also holy cow. i just saw that motor pulley... thats gotta be some kinda joke for a 6k machine! Edited 1 time(s). Last edit at 09/14/2018 04:08PM by warbunniex. Edited 1 time(s). Last edit at 09/15/2018 01:52AM by MKSA. What kind of patent could apply to that ???? Cables, strings in similar set up have been used and tried for decades if not centuries ( eg. plotters) ! They seem to have wrapped so many turns on the pulley, the whole motion is done by the 2nd layer of cable. At least they avoid the problem of accidently overlapping cables. So I decided to get some 100 pound fishing line for 10 dollars on amazon & used it as a hybrid system on my delta. It cut the belt length in slightly more than half and as allowed me to increase the acceleration & keep quality. And that got my thinking about hybrid systems. Could be not keep the belt & run a fishing line over top of it? I'm gonna test it on the y axis of our local maker space's tevo tornado but I think it would at least help a little bit with the belt stretch. Is belt stretch a problem? Does fishing line stretch less? Edited 1 time(s). Last edit at 10/01/2018 11:21AM by the_digital_dentist. Belt stretch can be a problem, especially under dynamic load. It gives us ringing. For a given cross section, PE fishing line has a less stretch than kevlar or glass fibres. It has a higher young's modulus than those two. It also outperforms steel cables but I can't remember if it was by weight or cross sectional area. Regardless of how it outperforms steel in terms of strength it has a much lower minimum bend radius which is useful. It's definitely something worth thinking about! Why aren't there Kevlar or highclass PE reinforced belts? I think, adding an extra layer around the belt would cut into the belt and destroy it eventually. It needs a higher tension then belt alone. Obviously ! The location of the core fiber strands are precisely located in the "neutral plane". where there is no stretch when the belt goes around a pulley. To add a layer outside and the belt will wrinkle badly. digital dentist - belt stretching has been a huge problem. specially for any prusa style machine with a 300mmx300mm bed. but also for machines like deltas with really long lengths of belt. it actually bothers me that chinese companies still use 6mm belt for the y axis of prusa style machines cause it would be the biggest improvement to performance if they went with a 15 or 20mm belt & would honestly not cost much more. mksa & o lamp - interesting I will have to record what it does to the belt over time! if the belt lasts even a year, id consider it worth it. The problem is the wrong choice of belt, material, width, length .... Chinese does it for a cost reason, even if the gain is minimal. They simply don't care about technicalities as long as people buy. And people keep buying because they don't know better. A bigger 3D printer ? Simple just longer extrusions, longer guides, longer belts. What about section, weight etc ... ? Ah it is important ? See here, plenty of example. Edited 1 time(s). Last edit at 10/02/2018 11:42AM by MKSA. there were about 19 glass cables, about 0.2mm in diameter running down its length. That would have a total cross sectional area of about 0.6 mm^2 (equivalent to 0.87 mm dia). Unless your cable is bigger than that, it is going to stretch more than a belt. I recently built a large corexy mechanism for a sand table using 0.5 mm diameter dyneema fishing line and it stretched a lot (maybe 10x) more than a belt. I have a direct comparison because I gave up on the cable and switched to belts in the same mechanism. Plastic cables creep which means the tension will drop after a while under tension, and you'll have to retension it. Creep can't go on forever and eventually the cable will fail as you retension it. Belt stretch isn't the main cause of ringing. The motor acts more like a spring than a belt ever will. 1mm+ thick cables are nothing new, I have some that I plan to use. That and you wont necessarily need that thick of a cable if it stretches less. If creep is an issue use a fiber/cable material that creeps less, Aramid or steel and the likes. If you're complaining about creep in aramid or steel you should be complaining about creep in belts too. Anyways, back to finding a solution to a cable drive. There are two main "issues", slipping and string walking. I'm not sure how much of an issue slipping really is with proper tension. The printer re-homes before each print so any slip is "reset" at that point, and I don't see artifacts like slanted walls or mini missed step like artifacts in cable driven printers that would suggest the cable is slipping noticeably. The answer to this is fairly simple, just anchor the line to the pulley or use an appropriate number of wraps or tension to avoid slipping. The second issue is string walking, and this is especially an issue with longer spans. Not necessarily because the error would increase substantially (as long as you keep the limits of travel at a reasonable distance to the drive pulley), but because it requires a longer and longer drive pulley. Usually the idler and driven end of the line "walk" in opposite directions which makes a changing angle which introduces some (possibly negligible, depending on machine size) error. In terms of getting rid of that error, you could "cross" the incoming and outgoing lines so they both walk in the same direction and the angle stays constant. You still need some length of drive pulley to accommodate this "walking" but it won't come with any triangulation error. For larger spans that would require ridiculously sized drive pulleys, you're better off going with polygonhell's stepped idler like solution that guides the cable along a consistent path but allows for a large cable to pulley contact. Those solutions are good enough for me and cover both small and large scale CNC machines. 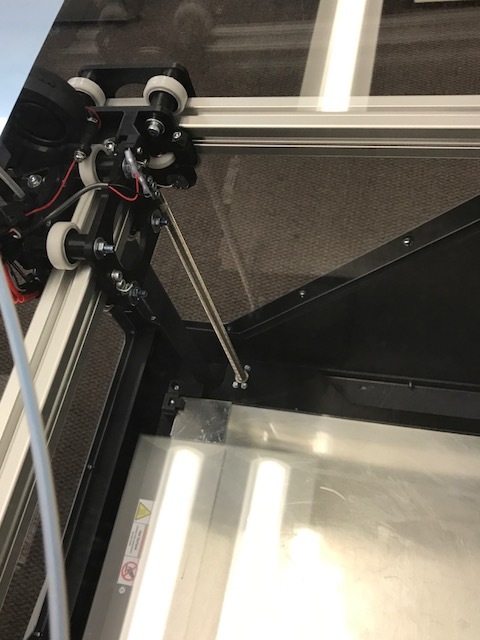 For small scale machines it may not be worth it since the cost of short belts isn't too big, but if you're building a large format machine ala hangprinter, maslow CNC or a large MPCNC like setup, the belts become fairly expensive. It's not the "best" solution performance wise but it may work "good enough" and is much cheaper (don't compare a short belt to a spool of cable, compare them length for length which is how you'll use them). I've also made experiments with fixed cable and the 'walking' issue was pretty neglectible for a 200mm travel. Now I think of a combination of the Cloverleaf drive and a fixed cable. That could eliminate walking and slip once and for all time. I agree with the cable stretch. I had to retension it very often in the beginning, because I didn't 'prestretch' it before use. Once it has stretched out, the braides are so tight that it feels really stiff. From then on, there is no more stretch. About ringing in the motors: Does a 1.8° stepper ring twice as much as a 0.9° stepper? Edited 1 time(s). Last edit at 10/03/2018 02:15AM by o_lampe. Digital dentist - So your saying the motor's are also responsible for ringing as the print turns a corner? I've done a lot to reduce electrical noise, have .9 motors, & use duets on printers. still get ringing when rounding corners. maybe i just have to keep increasing the belt tension. I have pretty good tensioners for each carriage & can already play a good tune on the cable/belt. Also the 100 pound fishing line I'm using is thick (2-3mm diameter of woven fiber). I'm pretty sure it is using more strands of fiber than are in those belts. Ask far as testing goes: I tiried putting the wire on top of the belt of the tevo & it didnt want to stay there so i put it next to the belt. It looks like it reduced belt stretching. I'm going to do a proper photo comparison & try a slightly different placement on the printer. The good news is, if it is an improvement for the tevo, its a damn quick & easy upgrade. only had to tap 2 holes in the carriage for the bed for some screws. okay cool. this is new info for me. what methods do people use? would a closed loop stepper help? edit: well thats an awesome link... down the rabbit hole i going it seems. never gonna run out of things to test in calibration. Edited 1 time(s). Last edit at 10/03/2018 04:53PM by warbunniex. No, it wouldn't, unless it had a very fast, sensitive position sensor and wide bandwidth control system. The error that creates ringing comes from the physical construction of the motor and the way it interacts with the moving masses in the printer. DC42 is working on changes to the acceleration profile that will minimize the ringing, but I suspect it will have to be tuned for each printer and may only work over a narrow range of settings. The stepper indeed ! Can be seen and adjusted to some extend by varying the stepper current. As for GT2 stretch versus round cable, seriously, the GT2 is basically just a FLAT cable(which is better than round of same section area) made with similar low stretch fiber plus some tooth. True you will get a cheaper round cable than a belt with the same "stretch" BUT to fulfill the other requirements the belt achieves, good luck to do it for the same cost and ease. If it can be done, even "good enough" ! Cables have been used in early robot arms decades ago. Edited 2 time(s). Last edit at 10/04/2018 03:09AM by MKSA.